You are here: Home › Further Reading › JFK Assassination FAQs › Did Lee Harvey Oswald Carry a Bag of Curtain Rods to Work? Did Lee Harvey Oswald Carry a Bag of Curtain Rods to Work? According to Buell Frazier, Oswald claimed that the bag he was carrying contained curtain rods. Oswald claimed to investigators that he had only carried his lunch. Either way, it is unlikely that the bag contained a rifle. According to the Warren Commission’s case against Lee Harvey Oswald, the alleged assassin carried his rifle into the Texas School Book Depository on the morning of the JFK assassination in a paper bag, disguised as curtain rods. Oswald does appear to have brought a paper bag to work, although there are reasons to doubt the authenticity of a home–made paper bag that was supposedly discovered on the sixth floor of the TSBD, close to the south–easternmost window from which Oswald is alleged to have fired shots. Buell Wesley Frazier, a colleague at the Texas School Book Depository, who drove Oswald to work ( Warren Commission Hearings , vol.24, p.409). Linnie Mae Randle, Frazier’s sister, who saw Oswald at their house before the journey ( ibid. , p.408). One TSBD employee, Jack Dougherty, saw Oswald arrive inside the building. He claimed that Oswald had nothing in his hands ( Warren Commission Hearings , vol.6, pp.376f). Oswald himself claimed to have brought a sandwich and an apple to work ( Warren Report , p.622). Do you know whether your husband carried any package with him when he left the house on November 22nd? I think that he had a package with his lunch. But a small package. Frazier claimed that on almost every occasion when he gave Oswald a lift to work, Oswald had brought his lunch with him. He said that Oswald was in the habit of carrying his lunch in “a little paper sack you get out of a grocery store” ( Warren Commission Hearings , vol.2, p.220). The one exception was the day of the assassination. Oswald’s wife and children were living at the house of Ruth Paine in Irving, several miles outside Dallas, while Oswald himself stayed during the week in a rented room much closer to his place of work. According to Frazier, Oswald asked for a lift to Irving on Thursday 21 November, and explained that he was going to collect some curtain rods ( ibid. , p.222). Frazier claimed that he asked Oswald the following morning what was in the paper bag: “And he said, ‘Curtain rods’, and I said, ‘Oh, yes, you told me you was going to bring some today’” ( ibid. , p.226). Oswald, however, denied that the bag had contained curtain rods. He claimed that the bag he carried had contained only his lunch. According to Captain Will Fritz, who interrogated Oswald, “He said he didn’t have any kind of a package but his lunch. He said he had his lunch and that is all he had …. He said, ‘No. I didn’t carry anything but my lunch’” ( Warren Commission Hearings , vol.4, pp.218. “No.” He said he wouldn’t have done that. That’s all he said about it. Was the Curtain Rods Story Genuine? Perhaps Oswald had lied to Frazier about the curtain rods, and the bag contained the rifle that was later discovered on the sixth floor of the TSBD. Against this is the testimony of Frazier and Randle, who each stated on two occasions that the bag they saw was much too short to have contained the rifle, even in its disassembled state. Frazier also claimed that the bag Oswald had carried was a standard grocery store bag rather than a hand–made package like the one that the Dallas police brought out of the building ( Warren Commission Hearings , vol.2, p.226). Perhaps Oswald had lied to Frazier about the curtain rods, and had actually carried his lunch to work as usual, in a large grocery store bag. Perhaps Frazier had mistakenly recalled an earlier reference to curtain rods, or for some other reason misreported Oswald’s words, and Oswald had actually carried his lunch to work as usual, in a large grocery store bag. Perhaps Frazier had mistakenly recalled an earlier occasion when Oswald placed a package on the back seat of the car, and on the morning of the assassination Oswald had actually carried a grocery store bag in his lap. Oswald had been in the habit of taking his laundry with him when being driven by Frazier to and from Ruth Paine’s house in Irving during his weekend visits ( Warren Commission Hearings , vol.9, p.343). There may well have been several occasions when Oswald placed a package containing his laundry on Frazier’s back seat. Perhaps Oswald had indeed carried curtain rods in the bag. Ruth Paine’s garage, from which he is supposed to have retrieved the rifle, did contain curtain rods that were about the right size to fit in the bag described by Frazier and Randle. Against this, there is no record of any curtain rods having been discovered in the TSBD, and Ruth Paine claimed that no curtain rods were missing ( Warren Commission Hearings , vol.9, pp.424f), although her husband Michael was less sure ( ibid. , p.461). Perhaps, as Marina Oswald ( Warren Commission Hearings , vol.1, p.68) and Ruth Paine ( Warren Commission Hearings , vol.3, p.46 and p.66) testified, the purpose of Lee Oswald’s visit was to reconcile with Marina after a quarrel, and the story of the curtain rods was simply a polite way of getting Frazier, a 19–year–old casual acquaintance, to mind his own business. The case against Lee Harvey Oswald required that he alone had brought into the Texas School Book Depository the rifle that was later discovered on the sixth floor of the building. One of the problems faced by the Warren Commission and its later supporters was the lack of evidence that Oswald had done so. Oswald appears to have purchased a rifle by mail order several months before the assassination (see Basic Facts of the JFK Assassination). The only place Oswald could have stored the rifle was in Ruth Paine’s garage in Irving, although the evidence that the rifle was actually stored there is at best circumstantial. The only occasion on which Oswald could have retrieved the rifle was when he stayed at Ruth Paine’s house the night before the assassination. The only evidence that Oswald had carried anything at all resembling a rifle on the morning of 22 November 1963 was Wesley Frazier’s account of Oswald carrying curtain rods. The official interpretation, in which Oswald invented the story of the curtain rods while returning to Irving specifically to retrieve his rifle, was used to illustrate the lone assassin’s deceitfulness and cunning. Whether or not Oswald had actually claimed to be carrying curtain rods, Frazier’s and Randle’s accounts demonstrate that Oswald had not been carrying a rifle: the paper bag he was holding was much too small, and was not the same type as the package supposedly found on the sixth floor. There is no credible evidence that Oswald brought a rifle into the TSBD himself. Either he had at least one accomplice, or the rifle was brought into the building without his knowledge. There is no way to tell whether any of it is true or false. Frazier may or may not have told the truth about what Oswald said, and even if Frazier had told the truth, Oswald may or may not actually have been carrying curtain rods in his paper bag. Whether any aspect of the curtain rods story is true or false, it has no bearing on the question of who killed President Kennedy. Whatever Oswald may or may not have said to Frazier, there is strong independent evidence that Oswald did not bring a rifle into the TSBD, and even stronger evidence that he was in any case not guilty of the assassination: for example, the paraffin tests which showed that Oswald almost certainly had not fired a rifle that day. and that Oswald had in fact carried a bag large enough to contain a rifle. The lack of popular trust in the Warren Report obliged a later lone–nut account, Case Closed by Gerald Posner, to attempt to justify the Report ’s assumption. Posner’s treatment of the paper bag episode does not resolve any important questions to do with the assassination itself, but it does provide one of the most brazen examples of misrepresentation in a case that is not short of such behaviour. Quotations from Case Closed are taken from the Anchor Books paperback edition of 2003. Posner accepts the parts of Frazier’s and Randle’s testimony in which they state that Oswald had carried a bag, but he claims that they were mistaken about the length of the bag. Linnie Mae Randle … saw Oswald walk across the street toward her house, carrying a long package parallel to his body. He held one end of the brown–paper–wrapped object tucked under his armpit, and the other end did not quite touch the ground. Initially, Randle said the package was approximately 27 inches long, and Frazier estimated a little over two feet. The disassembled Carcano is 35 inches long. … The bag [supposedly found on the sixth floor] was 38 inches long. Both Randle and Frazier said it looked like the same one Oswald carried that morning. It seems straightforward: Oswald was seen carrying a large paper package to work, and both witnesses may have underestimated its length. Rather than only being long enough to contain curtain rods, the paper bag may have been long enough to contain a rifle. Case Closed : Why Check the Sources? The uninformed reader of Posner’s Case Closed would have no reason to doubt that Posner was describing the witnesses’ testimony accurately. His book contains footnotes, which give the page numbers of the relevant passages of the Warren Commission’s Hearings and Exhibits . Only a relatively small number of copies of the Hearings and Exhibits were printed. Case Closed was published in the early 1990s, long before the relevant source material was placed online. The main target audience of Case Closed was opinion–formers in the media, a group which traditionally shows little interest in questioning anything that confirms its institutional prejudices. Because Case Closed told them what they wanted to hear, very few reviewers in the corporate media appear to have checked any of Posner’s sources. A work that did stimulate the media’s critical faculties was Oliver Stone’s film, JFK , which came out at around the same time as Case Closed , and to which the book was presumably a response. A comparison of the media’s attitudes to JFK and Case Closed would make an interesting case study. The context and credibility of Case Closed are discussed in the Fiction, Propaganda and the Media section. and Commission Exhibit 364: a replica of CE 142 without the discolouration. He [Oswald] held one end of the brown–paper–wrapped object tucked under his armpit, and the other end did not quite touch the ground. What was he [Oswald] carrying? He was carrying a package in a sort of a heavy brown bag, heavier than a grocery bag it looked to me. It was about, if I might measure, about this long, I suppose, and he carried it in his right hand, had the top sort of folded down and had a grip like this, and the bottom, he carried it this way, you know, and it almost touched the ground as he carried it. Let me see. He carried it in his right hand, did he? And where was his hand gripping the middle of the package? No, sir; the top with just a little bit sticking up. You know just like you grab something like that. And he was grabbing it with his right hand at the top of the package and the package almost touched the ground? When you saw him get out of the car, when you first saw him when he was out of the car before he started to walk, you noticed he had the package under the arm? One end of it was under the armpit and the other he had to fold it in his right hand. Did the package extend beyond the right hand? No, sir. Like I say if you put it under your armpits and put it down normal to the side. But the right hand on, was it on the end or the side of the package? No; he had it cupped in his hand. When Oswald approached the house, only Randle saw him. Oswald was holding the top of the package, with the bottom nearly touching the ground. When Oswald approached the Texas School Book Depository about 30 minutes later, only Frazier saw him. Oswald had the bottom of the package cupped in his hand, with the top under his armpit. Both witnesses’ descriptions are consistent with a package that contained either curtain rods or Oswald’s lunch. Frazier and Randle were emphatic that the package was nowhere near long enough to have contained the rifle. He [Oswald] held one end of the brown–paper–wrapped object tucked under his armpit, and [half an hour earlier, holding the package in a quite different way,] the other end did not quite touch the ground. Did Oswald’s Paper Bag Resemble the CE 142 Bag? If, if you were going to measure it that way from the end of the seat over toward the center, right. But I say like I said I just roughly estimate that that would be around 2 feet, give and take a few inches. Now we have over here this exhibit for identification which is 364 which is a paper sack made out of tape, sort of a home made affair. Will you take a look at this. Does this appear to be anything like the color of the sack you saw on the back seat? Yes, sir; I would say it was, it was more a color like this. It was more like this color, correct? Did it have tape on it or did you notice it? Well, like I say, I didn’t notice that much about it as I didn’t see it very much. Will you take a look at it as to the length. Does it appear to be about the same length? We have got a package here which is marked Commission Exhibit No. 364. You have seen this before, I guess, haven’t you, I think the FBI showed it to you? Now, was the length of it any similar, anywhere near similar? Well, it wasn’t that long, I mean it was folded down at the top as I told you. It definitely wasn’t that long. The width is about right. The width is about right. Can you stand up here and show us how he was carrying. Using this package as an example only? What he had in there, it looked too long. About how long would you think the package would be, just measure it right on there. I would say about like this. You mean from here to here? Yes, sir; with that folded down with this much for him to grip in his hand. This package is about the span of my hand, say 8 inches, is that right? He would have about this much to grip? What I remember seeing is about this long, sir, as I told you it was folded down so it could have been this long. I see. You figure about 2 feet long, is that right? A little more than 2 feet. You mean the entire bag? Fold it to about the size that you think it might be. This is the bottom here, right? This is the bottom, this part down here. I believe so, but I am not sure. But let’s say it is. And this goes this way, right? Do you want me to hold it? Is that about right? That is 28½ inches. I measured 27 last time. You measured 27 once before? Frazier is clear that the bag he saw was not, in Ball’s words, “a paper sack made out of tape, sort of a home made affair” ( ibid. , p.239) but a normal paper bag from a grocery store. One might expect Frazier to have mentioned the existence of tape from the Depository, had there been any on the bag he saw on the back seat of his car. and that the only sense in which the replica bag “looked like the same one Oswald carried that morning” ( Case Closed , p. 224) was the trivial one that both bags were made of brown paper. Will you take a look at it [CE 364, the replica bag] as to the length. Does it appear to be about the same length? When you were shown this bag, do you recall whether or not you told the officers who showed you the bag — did you tell them whether you thought it was or was not about the same length as the bag you saw on the back seat? I told them that as far as the length there, I told them that it was entirely too long. Well, as I say, like I say now, now I couldn’t see much of the bag from him walking in front of me. Now he could have had some of it sticking out in front of his hands because I didn’t see it from the front. The only time I did see it was from the back, just a little strip running down from your arm and so therefore, like that, I say, I know that the bag wouldn’t be that long. So far as being wide like I say I couldn’t be sure. Now, you said that some of the bag might have been beyond his hands, did you say? Yes, sir; I said it could have, now I am not saying it was. In other words, it could have been longer than his hands? Like I said, I remember I didn’t look at the package very much, paying much attention, but when I did look at it he did have his hands on the package like that. But you said a moment ago you weren’t sure whether the package was longer or shorter. And his hands because I couldn’t see that about the package. By that, do you mean that you don’t know whether the package extended beyond his hands? No; lengthwise, toward his feet. No; now I don’t mean that. What I was talking about, I said I didn’t know where it extended. It could have or couldn’t have, out this way, widthwise not lengthwise. In other words, you say it could have been wider than your original estimate? But you don’t think it was longer than his hands? Frazier clarified his ambiguous reply to Ball’s question about the package extending beyond Oswald’s hands: he was insistent that the package could have been wider, but not longer, than he originally thought, and nowhere near long enough to have contained the rifle. By taking only the ambiguous reply and ignoring the unambiguous clarification, Posner’s statement that “Frazier later admitted the package could have been longer than he originally thought” ( Case Closed , p. 224) was the precise opposite of the truth. Can Gerald Posner’s Case Closed Be Trusted? Gerald Posner’s Case Closed is over 500 pages long. 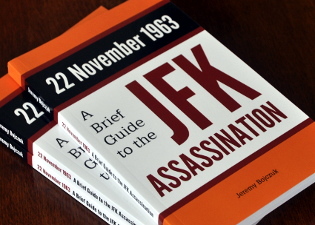 The occasional mistake or oversight is only to be expected when a book of this size deals with a subject as complex and intractable as the JFK assassination. Posner’s misleading account of the paper bag, however, can hardly be put down to an honest mistake or a misunderstanding of the witnesses’ testimony, which in this instance is essentially clear and unambiguous. His treatment of the evidence is difficult to equate with that of someone genuinely searching for the truth of the assassination. So many critiques of Gerald Posner’s Case Closed are now available in print and online that it is inexcusable for any commentator to take it seriously without first checking a more objective source. Some wilfully ill–informed members of the news media, however, still do. Curtain Rods, Lunch or Rifle? If Posner’s is the best case that can be made for the propositiion that Lee Harvey Oswald carried a rifle into the Texas School Book Depository on the morning of the JFK assassination, it is safe to conclude that Oswald did not do so, and that the rifle which implicated him in the shooting was almost certainly brought into the building without his knowledge.